Fulha chila is rarely made snacks in Chhattisgarh.It is made of fresh pumpkin flowers. Take 10-12 pumkin flowers n chopped it minutely. Take 1-2 bowl gram flower and add chopped flower . Add chopped onion , salt,turmeric, chopped green chili or red chili powder,cumin powder, freshly chopped coriander leaves. Add water & mix well all of the ingredients , the consistency of the paste would be thinner. Heat a pan and sprinkle oil on it ,with the help of a spoon spread the paste in round shape. Now cover it and cook it for 2 -3 mins in medium flame. Open the cover and wait for second and sprinkle the oil on the top and try to change the side of chila /pan cake and cook it until it gets the dark yellow or brown colour. Once fulha chila is ready,one can enjoy it with green chantney over the tea. Note : We should appreciate our traditions, where all kind of thoughtful recipes are available. Fulha chila is nice way to consume protein & one of the highly nutrition part of the plant that is “flower”. Same preparation can be done with drumstick flowers. peel off the outer green spiky cover. Now chop into big equal pieces . wash 1-2 potatoes(optional) and cut into equal 4 pieces . semi fry or deep fry both the vegetable together for 1-2 min . Take oil in a pan and put 1-2 table spoon of ginger garlic paste . Add fine chopped (or grinded onion) .cook in slow flame until onion turns brown . Now add fine chopped tomatoes and let the mix cook some more time , add salt, turmeric powder, chilli powder, coriander powder, and cook the mixture 1 more minute. 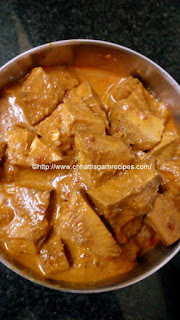 Now add fried jackfruit and potato with the onion tomato mix, cover the pan and cook it some more time. Open the cover and mix 300-400 ml of hot water in it. Let the water boil and now transfer whole material into the cooker and let it whistle for 5-6 times . Hot tangy jack fruit is ready to serve with steamed rice. 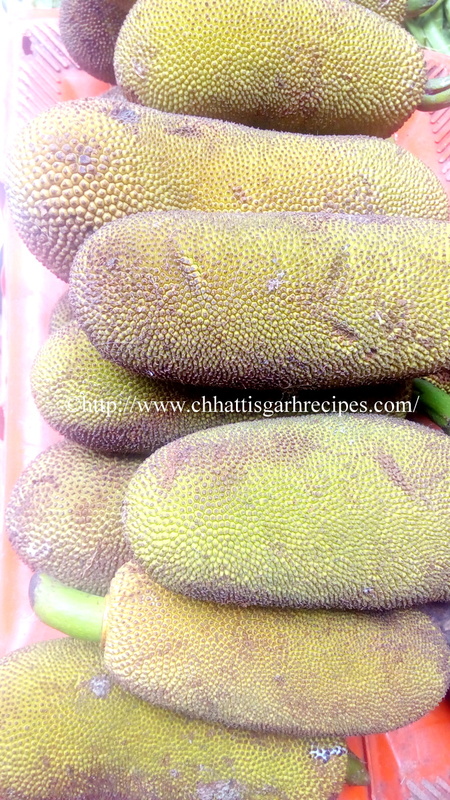 Note : Jack fruit is eaten in everywhere in india .The richness,texture & preparation of the vegetable is considered as nonveg of vegetarian. The jackfruit is highly fibrous and content good source of energy .